« Federal Reserve Money Injections Since 2000 Haven’t Worked as Advertised. Counterfeiting by the Federal Reserve, Although Legal, Still Results in Theft. Counterfeit—1. make an imitation of something genuine so as to defraud. 2. an imitation made to deceive. Is it legal for you to counterfeit money and try to purchase goods with your printed dollars? It’s illegal because it is theft. You are exchanging something for nothing. You get a good or service that was the property of someone, and they get a counterfeit bill. When that person tries to use the counterfeit bill in a future exchange and it is swiped with the pen and found to be counterfeit, at that moment he knows the good or service he once owned was stolen. 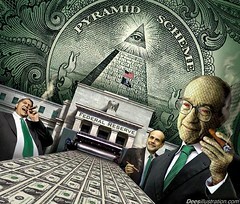 When the Federal Reserve injects counterfeit money into the economy it’s theft, except it’s theft by a thousand cuts. Whoever receives the money first benefits because the purchasing power of the money is highest at the beginning of the money injection. As the money works its way through the economy, prices rise and the purchasing power of each dollar declines. Those who are late to the party pay the higher prices. This process doesn’t happen all at once it takes time for the money to filter through the economy. Banks and Government receive the money first and get the most benefit, which is why they don’t want their drug dealer, The Fed, to go out of business, let alone be audited. To understand how this counterfeiting, money injection, leads to the Boom Bust Cycle, Mises uses the example of someone printing bread certificates. Does the printing of bread certificates supply one loaf of bread? If bread certificates are printed in high numbers for an extended period of time, what happens? The baker runs out of bread before the end of the business day and will raise the price, in bread certificates, for a loaf of bread. He then has to decide if this is a trend or just a blip in the bread market. If he decides this is a trend, he has to start working more hours to meet the new demand , and might have to hire more employees. If demand continues to out strip supply he may decide to put in a couple of new ovens, or he might have to add on and remodel his bakery. Everything seems to be going well but the new demand is a bubble activity and will end when the printing of the bread certificates stops. When this happens, demand falls, the reality that the new building, ovens, labor, steal, wood, capital, etc., have been misallocated in order to meet the artificial demand, caused by the printing of bread certificates, the owner has to lay off employees and cut his losses by selling whatever he can for any price. In the housing bust of 2007 a similar thing happened. The Fed pushed certificates of purchase to the banks, which were loaned out and started fueling the housing boom. The printed certificates of purchase were used to bid away scarce resources from other economic activities, driving up the price of resources, capital, labor, land, etc., especially those used to build housing. When the bubble couldn’t be sustained, prices plummeted and businesses that arose because of bubble activity were liquidated. The Fed has tried to prop up asset prices and the economy, since the 07 bust, by counterfeiting certificates of purchase on a much greater scale than what fueled the original boom. The cure for the problem is to quit printing certificates of purchase and allow the misallocations and malinvestments to be liquidated. The pain will be worse now then if they would have allowed the original Fed induced housing boom to run its course, which is why they will continue to try to prop up the economy with low-interest rates and printing. All these resources have been stolen from the market. We have all paid for this theft through inflated prices. We haven’t talked about interest rates and their role in the free market, and the business cycle. We will in a future post. For a more in-depth analysis, read this article by David Gordon at Mises.org. This entry was posted on September 29, 2012 at 4:56 am and is filed under Econ. 101, Government and Politics, Hall of Fame. You can subscribe via RSS 2.0 feed to this post's comments.